It has been awhile since we have talked about a Siri related Cydia tweak so I thought it was time to bring BatteryLevelAE to the light of day. What the BatteryLevelAE Cydia tweak allows you to do is get Siri to estimate your battery life stats. Upon asking Siri something like “how much talk time do I have left?” you will be responded with a rough estimate of how much battery life you have left for that specific iOS function. The responses are based off your current battery life and also Apple’s official stats for your iOS device. For the full list of commands available you can ask Siri “battery help menu” and you will be shown all the commands that BatteryLevelAE features. 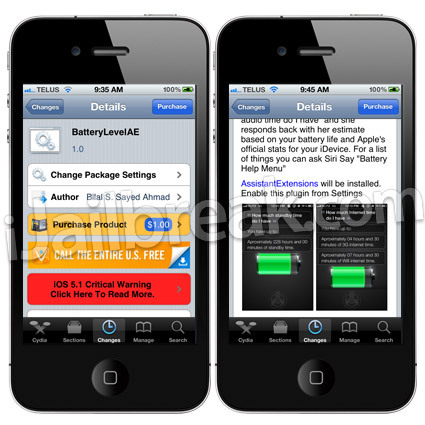 Note: The BatteryLevelAE Cydia tweak is an addon for the AssistantExtensions Cydia tweak, which is a free tweak that gives developers a great place to start for developing Siri related plugins.